Crouching, twisting, miles of walking — golf is harder on the knees than it seems, but the bionic assist of the Levitation® 2 knee brace can reduce muscle soreness and fatigue, so you’ll get back to the clubhouse as fresh as a daisy. Walking thirty-six holes is a workout, even with healthy knees. When osteoarthritis or cartilage injuries slow you down, some of your favourite pastimes are the first things you lose. Golf seems like such a gentle sport, but swelling, crunching knees can make you dread going to the course every week. Luckily, our bionic knee braces can help you reclaim your game. 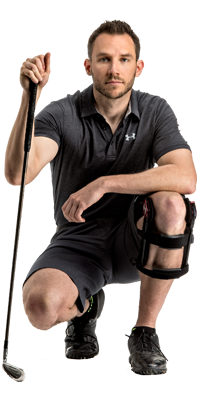 The Levitation knee brace is designed to promote proper form while increasing quadriceps output. It absorbs kinetic energy when you bend your knees and releases the energy when you straighten your knees. The Levitation can be used to help you power through the entire course, with enough energy left to crouch to line up the final shot.